Do you manage Facebook ad campaigns? Wondering how to automate tasks such as raising or lowering bids or pausing underperforming ads? 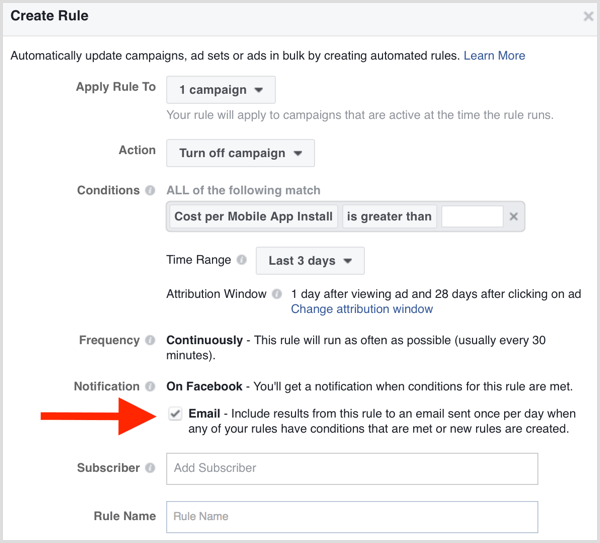 In this article, you’ll discover how to set up automated rules for your Facebook advertising campaigns. 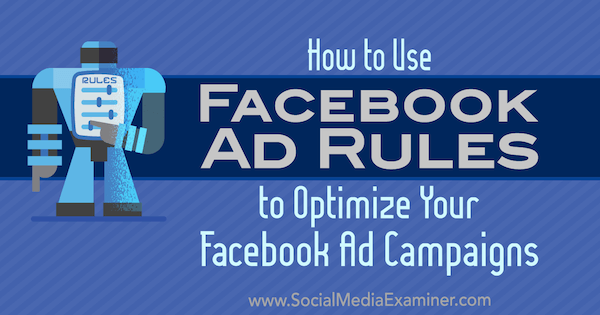 How to Use Facebook Ad Rules to Optimize Your Ad Campaigns by Johnathan Dane on Social Media Examiner. Keeping up with the day-to-day fluctuations of your Facebook ad campaigns can be time-consuming, especially when multiple team members work on them at the same time. This is where Facebook’s ad optimization rules can help. 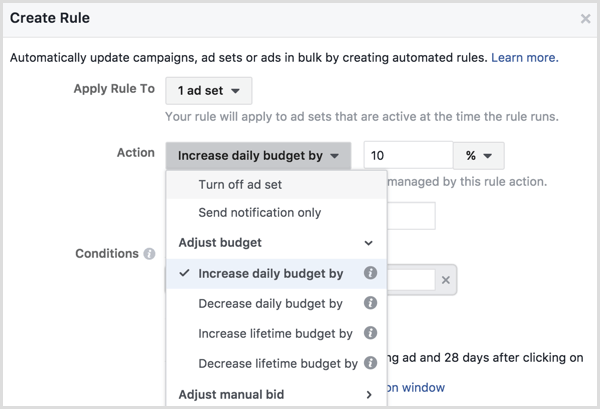 Creating rules lets you automate the process of checking your campaigns, raising and lowering bids, watching for ad fatigue, and more. Setting up optimization rules is simple and straightforward. 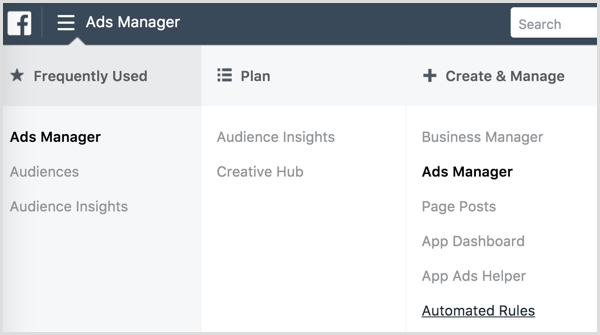 When you open the main view of Facebook Ads Manager, you’ll see the Create Rule button. Because you can apply rules to campaigns, ad sets, and ads, this button is available from each of these tabs. Select the checkbox next to the campaign, ad set, or ad to which you’d like to apply the rule and then click Create Rule. The window that pops up is where you define the key parameters to set up your rule. The first step is to ensure you assign the rule to correct elements of your campaigns. 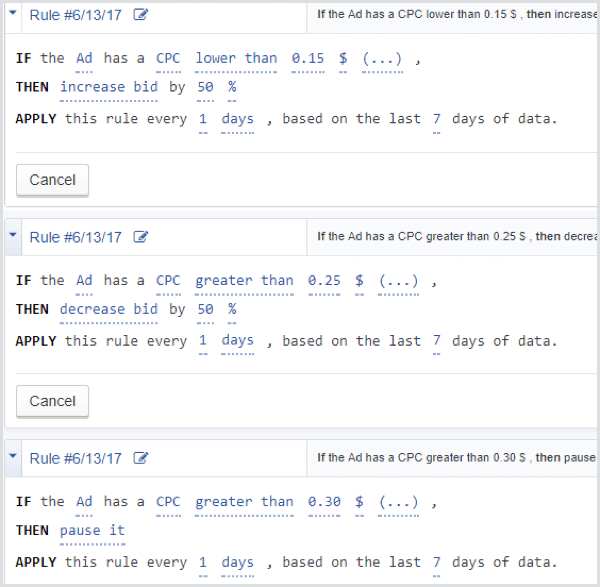 Click the Apply Rule To drop-down menu and select specific or all campaigns, ad sets, or ads. Next, pick an action for Facebook to initiate if the ad isn’t performing. Your options are pause campaign, send notification, adjust the budget (increase/decrease by), or adjust the bid (increase/decrease). In this example, we’re increasing the daily budget by 10%. Now select the conditions that will trigger the action you just defined. You can choose from many triggers such as budget spent, frequency, or reach. Each condition comes with a qualifier for a value of your choice (is greater than, is smaller than, is between, or is not between a manually entered value). For instance, you might select a cost per click (CPC) lower than a certain amount as a trigger to increase your daily budget. Finally, give your rule a name. You’ll have an option to preview it before finalizing your setup. When you’re finished setting up your rule, click Create. To manage your rules, open the main menu at the top-left corner of Ads Manager and select Automated Rules. Now that you know how to create a rule, let’s look at three common scenarios where optimization rules will make your life easier. Watch the money. If certain core pay-per-click (PPC) metrics start to slide (like cost per lead), you want to catch them before blowing through your budget. Don’t stop or pull ads too early (before they’ve had a chance to do their thing). Remember the big picture. This is important because campaigns could be taking a dip for reasons beyond your control. To illustrate, it took six months for Spearmint Love co-founder John Lott to realize that his customers’ life stage, not his ad campaigns, was the reason for stagnating results. Ad fatigue is real (more on that later) but external factors (like your customers literally outgrowing you) will ultimately have a bigger impact on your bottom line. The same holds true if your business is cyclical. You might look like a genius no matter what over the holidays, whereas your hands are basically tied when demand slackens in the summer. Let’s start with the basics. You can only afford to spend so much to acquire a customer. Maybe that’s a specific cost per acquisition (CPA) or you’ve defined an acceptable CPC range. The point is that you can define those limits. For instance, if the CPA jumps above $50, you can pause the ad so your campaign profitability doesn’t suddenly flip upside down. You can do the same thing on a CPC level, such as if the CPC rises above $0.30. This will help ensure you don’t pull the plug on campaigns too early. Because once campaign results do start to improve, you may want to be more aggressive to maximize conversions. Let’s say the opposite scenario is playing out: campaign CPC or CPA is decreasing. In this case, you might want to raise bids to capitalize on the positive trends you’re seeing. You can use a percentage based on the average of a few days to purposefully increase bids. So far so good, but this was just your first campaign and you’re still getting your feet wet. You don’t want to blow through too much money too soon before properly analyzing what you’re seeing. Go ahead and create another cap to pause the campaign when it hits a certain spending limit. If you think about it, you’ve just defined a bunch of campaign limits: how much you’re comfortable spending (in total), acceptable CPC and CPA maximums based on your profitability margins on each sale, and the best-case scenario of how high you can push bids before eroding margins on the other side. You’ve limited the upside and managed the risk on the downside. Now your campaign can virtually run on autopilot with Facebook’s optimization rules doing the tweaking for you. AdWords text-based search ads are evergreen. Once you identify a winning combination of variables, you can let them ride. Performance might fluctuate a little over the next few weeks or months but you won’t see drastic declines all of a sudden. Facebook ads are different, unfortunately. New ads may work wonders over the first week or so, and then performance will slowly start to decline. There are many reasons why this happens, but ad fatigue is the most common culprit. Your ad creative might seem super-clever the first time users see it, but not the tenth time. That’s where a frequency cap comes in. Generally speaking, you start risking ad fatigue when your frequency creeps into the over-5 range. To avoid this, create an optimization rule that automatically pauses your campaign when it hits a certain frequency threshold. However, paused campaigns aren’t ideal. Stopping the campaign before ad fatigue sets in is one thing, but you can’t just let campaigns remain paused once they hit that frequency cap every few days. So when you set up the rule, choose the option to email a notification that explains what just happened and what to do next (namely, update the ad creative and restart the campaign) to you or the person managing the campaign. You can even set up email alerts to break down all campaign activities from the last 24 hours, which is especially helpful when working on campaigns with multiple team members. To turn on email alerts, select the Email checkbox in the Notification section when you create a rule. Sometimes, people have PPC all wrong. Remember, your PPC objective is to make money, not save money. Sure, cost per lead is important, but maximizing the amount of money you make per sale is important too. However, you can’t save your way into success. 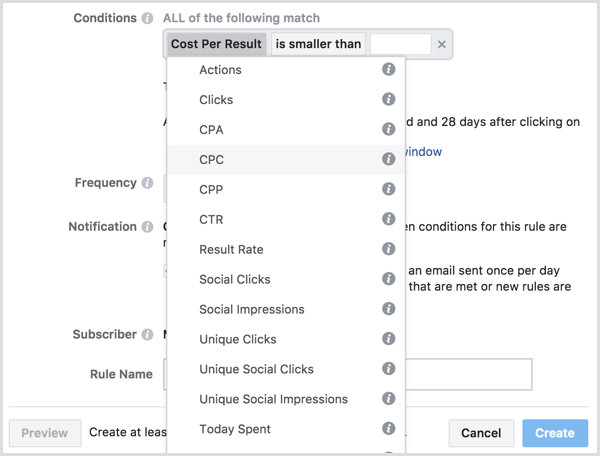 Cost per clicks matter to a point, but you should be okay with purposefully bidding up CPCs if it means making more sales at the end of the day. To use this tactic for your Facebook campaigns, create three rules that, when combined, will enhance the good, weed out the bad, and put a halt to the really, really bad. But what if you have free opt-ins, like an ebook, newsletter, or webinar, that you use to bring in top-of-funnel leads? These are still an investment that will pay off later when prospects do eventually purchase from you. Once again, CPC matters, but not as much as your CPA. Suppose that each new email address is worth $2 (based on the historical average of conversions from email). So you can create another optimization rule that disregards CPC to instead focus on the maximum CPA you’re comfortable with. In this example, that’s $1 for a 50% CPA. For low-margin businesses, that might be much too high. For high-margin ones, that might be fine. Many high-growth companies will spend up to 100% of an initial sale (effectively breaking even) to maximize the number of customers, and eventually will make up that cost on the back end in retention or repurchases. The point is that at this stage, CPC becomes irrelevant. A $2 CPC vs. a $1 CPC literally doesn’t matter. There’s no hard and fast rule here; it depends entirely on your business model. Social media marketers optimize all sorts of things such as landing pages, audiences, and ad creative, but not day-to-day campaign management. That’s where Facebook’s ad optimization rules come in. You can set up rules to raise bids when things are going well, lower them when they’re not, and even pause them when things look ugly. Rules can help limit your downside risk while allowing you to take advantage of the upside. You can also use them to keep track of all of the small, tactical stuff so you can focus on the big picture: making the most money possible. What do you think? 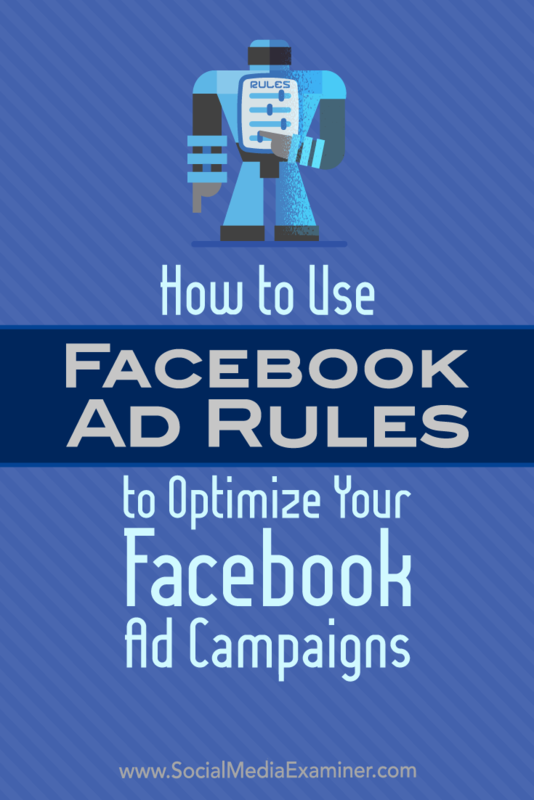 Which of these Facebook ad optimization rules would help your business? Please share your thoughts in the comments below. Johnathan Dane is the Founder of KlientBoost, a PPC agency focusing on CRO and aggressive testing. If you like what you just read, you should see what their custom growth proposal looks like.